The IDP database is now online, if you are already on the IDP mailing list your personal username and password are included with the mailed copy of the newsletter. Otherwise you can log in as a new user. The interactive online database gives access to details on over 20,000 manuscripts and documents held at The British Library, with over 1,000 images. New images and data are being added weekly. Users are encouraged to send comments and their own research for inclusion (click 'add your own research' on 'Text Detail' screen). Right:Delegates being guided around 'Building 2' of the Staatsbibliothek by Dr Feistel. During the second international conference on the 'Conservation of Manuscripts from Dunhuang and Central Asia' in Paris and Chantilly (see IDP News 5) the representatives of the Berlin collections proposed their home town as venue for the next meeting. At the same time, those present agreed that in future the group should be extended to include more museum specialists and that the next conference should also deal with the problems of preserving and restoring materials from Central Asia other than just manuscripts. Thanks to a generous grant by the German Research Foundation (Deutsche Forschungsgemeinschaft), we were able to proceed with our plans for a conference in Berlin in May 1998. The Museum of Indian Art and its director, Marianne Yaldiz, joined the Staatsbibliothek as host and provided addresses from the museum world. Thus it became possible to contact and invite colleagues from Uzbekistan, Kazakhstan and Kyrgyzstan, and from Urumqi as well as Beijing. As we used a small lecture hall in 'Building 2' of the Berlin Library, it seemed logical to begin the conference on Wednesday with a guided tour of this part of our library. Designed by Hans Scharoun, it was opened in 1978. At that time readers seemed almost lost in the impressive reading room; by 1989, however, the library was running out of shelf space and the reading room had become crowded. When the Berlin wall came down, it was overrun by many new users from former East Berlin, and readers have to search desperately for a space. This is despite the fact that the library now consists of this building as well as the older one ('Building 1'), which had been built before World War I for the old Royal Library, one of the present library's precursors. The conference proper started in the afternoon (see 'Conference Programme'). Other activities included an evening reception hosted by the Library's Director General. Refreshments were provided thanks to the generosity of the Society of Friends of the Berlin Library and a Berlin brewery, Schultheiss. On Thursday evening, we were invited to the Turfan research centre of the Berlin-Brandenburg Academy of Sciences, where the specialists who are editing and cataloguing Berlin Central Asian materials presented and explained their work, published in the series Berliner Turfantexte and Verzeichnis der Orientalischen Handschriften in Deutschland, respectively. Friday afternoon was reserved for visiting the collections - both Turfan and other Oriental manuscripts - as well as the restoration laboratories of the Staatsbibliothek. For many, this was the highpoint of the conference, as it was the chance to see both the advanced technical equipment being used, as well as examples of the day-to-day work of the restoration specialists. They are headed by Ernst Bartelt, who over the years has developed new techniques specifically for the conservation and restoration of oriental manuscripts and assembled the necessary equipment. Photo and video cameras are used for detailed documentation of all work. Video-enhanced microscopes, using many different wavelengths of light, help analyze materials such as paper fibres and make faded writing more visible. A chamber for climate control was developed here; among the work it has been used for is the restoration of an album of Indian miniatures and calligraphies, assembled for Emperor Jahangir. The pages, pasted back to back, can be gently pulled apart when treated with closely controlled moisture; in addition this treatment also revive binding agents of the colours and cleanses the surface of the miniatures. The pages are then placed in acid-free mounts and reassembled in boxes. Special bindings, cassettes for exotic materials, and other examples testified to the high professional standards of the people working here. As there is no generally approved formalized instruction for paper restorers, the Staatsbibliothek over the years has taken on talented journeymen book binders, and trained them to become both master bookbinders and restoration specialists, highly proficient in all fields of work to be expected in a library with holdings as diverse as ours. Here also all materials used for restoration and conservation projects are being tested; an example shown was the artificial ageing of leather to test its usability in restoration work. The guiding principle for all work done is the preservation of the historical substance of all objects treated. To achieve this, only natural materials are used with well established ageing (or rather non-ageing) properties, and nothing is being done which cannot be undone, if necessary. On the final day, Saturday, we removed to the Museum of Indian Art, situated outside the city centre in Dahlem. The International Dunhuang Project was discussed and participants from Central Asia made known their urgent need for help and training in conservation and restoration. Monique Cohen (BNF, Paris), Mark Barnard (BL, London) and Ernst Bartelt were elected to an informal group which is to consider ways of meeting their needs. Finally, the Museum's collections - as the building needs refurbishing, they were in early stages of dismantling - and its restoration workshop were visited: here too our guests could get a close look at the practical side of conservation work. Indian snacks in the Museum garden and pleasant summer weather made for an congenial ending to a conference, which we hope will be remembered by the participants with fondness. Administration and Utilization of Central Asian Materials: Cataloguing, Databases, Digitization. Masud Samibayev: Problems of conservation and restoration of the wall paintings from the palace of the king of Samarkand in Afrasyab. Mark Barnard, Ernst Bartelt, Robert Davies: Aspects of Conservation of Central Asian materials. 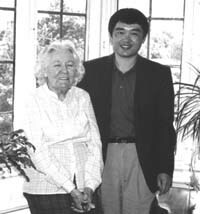 A conference in New Haven, Connecticut, on July 10-12, 1998, marked the close of the three-year 'Silk Road Project: Reuniting Turfan's Scattered Treasures', funded by the Henry Luce Foundation. The twenty-five original members of the project - including twelve Americans and thirteen Chinese - presented papers, as did eleven other scholars also working in the field of Silk Road studies. As a group, these papers show that the field of Turfan studies has taken shape so quickly that it has already spawned sub-fields. Wang Binghua's paper was the only one that addressed the important subject of the original residents of the Turfan oasis: the Jushi (or Gushi) people. A group of rectangular vertical pit tombs at Jiaohe suggest that these pit tombs were those of the Jushi people, whose tombs differed markedly from the sloped path tombs so characteristic of later Chinese settlers who settled Turfan in the third and fourth centuries AD. Mariko Walter, Stanley Insler, and Yang Jidong discussed evidence of Buddhism at other Silk Road sites including Niya, Parthia, and Dunhuang before AD. 500. Richard Frye explained why he emphatically did not believe the mummified corpses of Xinjiang were Tokharians. Many papers examined different aspects of Chinese society, institutions, religion and art during the Gaochang kingdom (500-640) and direct Chinese rule (640-803): Janet Baker (Buddhist images), Chen Guocan (taxes), Deng Xiaonan and Judy Chungwa Ho (women), Al Dien (tomb inventories), Sarah Fraser (artists and workshops), Valerie Hansen (the spread of Buddhism into Turfan), Ma Shichang and Yamabe Nobuyoshi (cave art), Elizabeth Owen (motif of pearl roundel) Qiu Ling (epitaphs), Rong Xinjiang (Daoism), Eric Trombert and Victor Xiong (the equal-field system), Wu Min (textiles), and Zhu Lei (social strata). Some participants were interested in the influence of Iranians and other foreigners in Turfan. Jonathan Skaff examined numismatic evidence, Angela Sheng textiles, Oktor Skjaervo textual evidence, and Zhang Guangda the faint traces of Mazdean (Zoroastrian) religious practice surviving in the Turfan documents. Their papers conclusively showed that the Iranians maintained a significant presence in Turfan in the 6th and 7th centuries. Wu Zhen presented a wide variety of textual and artistic evidence of non-Chinese presence in Turfan and explained the changing meaning of the term 'Rhu', while Marc Abramson also examined a variety of Chinese ideas about foreigners in the Tang period. Annette Juliano and Judith Lerner analyzed the Iranian motifs in the Miho Museum Funerary Couch, and Larissa Schwartz introduced the Sogdian tombs from Guyuan, Ningxia. The very new topic of the period of Uighur rule (802-1283) received much attention from Kahar Barat (Buddhist hierarchies), Zsuzsanna Gulacsi (Manichean Pictorial Art), Denise Leidy (Buddhist iconography), Lilla Russell-Smith (Uighur Art at Dunhuang), Nancy Shatzman Steinhardt (architecture of Beiting), and Israfel Yusuf (Uighur contracts). Eva Jane Neumann Fridman presented the latest paper chronologically, which analyzed the mixing of shamanism and Buddhism among the Kalmyk and Buryat Mongols. Interested readers may consult the project web-site for abstracts of these papers and information about ordering a hard copy of the conference proceedings, which should be available from October 1998. We estimate the cost of copying to be around $50.00, and we will mail by air or surface mail. Our web-site will also contain information about papers accepted for publication. We also plan to post three different items that are the products of this project: 1. An introduction to the history of Turfan and of the different expeditions that excavated the site by Zhang Guangda and Rong Xinjiang. 2. A bibliography of mostly Chinese-language articles about Turfan compiled by Rong Xinjiang. 3. A database of over 3,000 Turfan documents and artifacts compiled by Deng Xiaonan, Valerie Hansen, Katherine Lee, Elizabeth Owen, Eric Rasmussen, Rong Xinjiang, Larissa Schwartz,Wu Jianguo, and Zhang Guangda. This database concentrates on items published in Chinese; we have not input the many artifacts and documents published by English, German, and Japanese expeditions on the grounds that they are familiar to Western readers. The database has been made using Access (Office 97) and TwinBridge Chinese software. Anyone who would like a draft version to test, and anyone who has other questions about the project, should contact Valerie Hansen (valerie.hansen@yale.edu). The following articles have been written specially for IDP News by experienced conservators working at major restoration laboratories in Tokyo and Kyoto. W. Andrew Hare has been working at the Usami Shokakudo Co. Ltd in Kyoto for eight years and gives an overview here of the dry and wet methods of restoration used on early Chinese and Japanese paper manuscripts. Katsuhiko Matsudo has written extensively on paper making and has been at the Restoration Department of the Tokyo National Research Institute for Cultural Properties since 1973. In his paper he talks about the problems encountered in restoration of a specific group of Loulan manuscripts and details the restoration work. The origins of Japanese mounting can be traced to the development of writing and painting on flexible supports of bark, fabric and paper that evolved in Central Asia and China over 2,000 years ago. These simple formats of scrolls and folded books further developed with the concurrent spread of Buddhism throughout Asia and the inherent need to record and convey a copious body of teachings and imagery. Among the earliest and most important examples of these handscrolls, books and banners are many that come from the Buddhist caves at Dunhuang in Western China. Buddhism was first transmitted from China through Korea to Japan during the Nara period (AD 645-794) and in numerous subsequent waves of continental cultural influence. With Buddhism came texts and sutras that contained the basis of the writing system that Japan would adopt, as well as the formats, materials and methods of mounting. Eighth-century documents from the Shosoin, the Imperial storehouse at Nara, list the work of monk-craftsmen in preparing sutra copies. From the dyeing, beating and formating of paper before the text was copied, to the attachment of the roller, cover and tying cord to complete the scroll, the division of labour and productivity is carefully recorded. These unassuming handscrolls, usually made of hemp based papers, often dyed yellow and lined with columns of characters written in carbon black ink, were clearly based upon Chinese models. Yet, by the flowering of the Heian period (AD 794-1185), a Japanese taste for extravagant decoration became predominate: multi-coloured papers decorated with printed and hand drawn designs, sutra texts copied in gold and silver and frontispieces illustrated in colour. Throughout the following centuries of repeated foreign influence, interspersed with periods of isolated innovation, Japanese mounting evolved in many distinct ways. The silk and paper of Far Eastern painting and calligraphy are delicate materials. Even if carefully handled and stored, wear from use and the inevitable degradation of materials leads to damage and deterioration. 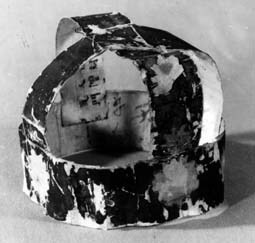 Scrolls from Dunhuang, for example, show early repairs made with pieces of paper pasted to the back of damaged areas. Though it is not clear how far back in antiquity the pratice of lining scrolls and hangings with sheets of paper and paste developed as a method to support them for safe display and use, these techniques certainly evolved along with the need to repair and strengthen older, damaged scrolls. As the practical concerns of function and format intermixed with the aesthetics of display, mounts became more elaborate while always remaining an integral part of the object. Yet, however well made, mounts weaken and repairs become necessary to maintain the aesthetic and functional integrity of the object. This conscientious cycle of repair and remounting has been essential to the survival of a majority of paintings and documents in Asia and is, therefore, the basic concept of restoration and conservation in China and Japan. The techniques and philosophy of mounting and conservation that have developed over centuries in Japan are still passed down through a traditional apprenticeship system in private studios. These studios and their work are now overseen by the Agency for Cultural Affairs, part of the Ministry of Education. Significantly, the Japanese government began enacting a series of laws to designate and protect cultural properties as early as the late nineteenth century, a period of intense Western influence. Later, during the turmoil following World War II, laws and committees were created to provide continuous national support for the conservation and preservation of cultural properties. As recently as 1975, these laws were amended to include a system for preserving conservation technology as well as the crafts that produce traditional tools and materials essential to mounting and conservation. Concurrently, a network of national and local conservation research centres and universities has formed to provide research and technical support. Along with this brief background, I would like to outline some conservation methods and materials currently used in Japan. Though objects with complicated mounting structures such as hanging scrolls, screens and handscrolls will usually entail very complicated treatments involving multiple linings and the replacement of deteriorated mounting materials, the methods I will mention here are intended for the relatively less complicated formats of early books and scrolls. Specifically, I will present techniques used by the Usami Shokakudo Co. Ltd., one of four studios that treats cultural properties within the Conservation Center for Cultural Properties at the Kyoto National Museum and where I have been training for over eight years. Large groups of documents from Japanese temple and shrine collections, often containing Chinese materials, are treated every year in Japan. Commonly these collections will contain thousands of sheets of paper in the form of letters, books, handscrolls, etc., dating anywhere from the eighth to the eighteenth centuries. The condition of the objects ranges from having been repeatedly treated to almost pristine. The first concern is to examine each object carefully and take fibre samples when appropriate. Format, sheet dimensions and formation, fibre distribution and content, thickness, density, laid and chain lines, surface treatment, folds, cuts and attachments, etc., are recorded. Each object is individually photographed. Treatment methods are then discussed. The most common concerns are infilling losses, strengthening tears and creases and repasting the seams and bindings of scrolls and books that have come apart. The selection of a repair paper that is a close match to the paper of the object to be treated is a great concern as this will dictate the compatibility and durability of the repair as well as its aesthetic effect. In accordance with the information gathered, a suitable paper is chosen from a large stock of old papers. Fibre content, density, thickness, chain and laid lines and colour are essential to finding an appropriate match. Adjustments will be made to the colour and thickness as necessary or, if no suitable match is found, a new paper will be hand-made by a paper maker utilizing traditional methods, materials and the analytical data gathered. To infill losses, a wet or dry method is chosen depending upon the object. For example, a thin document made from long fibred paper mulberry (kozo) will commonly be humidified and spread flat on a piece of protective rayon paper (a synthetic, protective sheeting). Damaged areas are aligned. The repair paper is then be water cut, using a variety of methods, so that the fill is shaped to fit the loss with a few millimeters of fibre overlap to hold the fill in place. Wheat starch paste is applied to the edge of the loss, the fill is set in place and the feathered edge is smoothed down. A small amount of sea weed gelatin may be added to the adhesive to prevent potential translucence or discoloration of the paper. Tears or creases are reinforced from the verso where necessary using extemely fine paper (tengujo, etc.). The document is then air dried. Flattening is accomplished in several ways. The rehumidified sheets may be friction dried (pressed between blotter papers). For large sheets, lengths of sheets that are attached (scrolls), thicker papers, special surfaces, etc., a method known as 'water stretch-drying' (mizubari, also known as 'envelope drying') may be used. Each sheet is humidified and then layed between two humidified sheets of thin rayon paper that are approximately two inches larger than the object on all sides. (The grain of the two sheets of rayon paper may be crossed.) The three layers are placed together on a drying board and the outer half inch of the double thickness of rayon paper is pasted down. This method has all the advantages of conventional stretch drying on a drying board without all the disadvantages of attached false margins. The envelope of rayon paper eliminates the danger of the object tearing from too much tension. Also, the rayon paper protects the surface of the object during extended periods of drying. Stiff, thick, short fibred, coated, beaten or dyed papers are often infilled using a dry method. For example, kozo papers that were beaten to make a smoother surface for calligraphy or more durable pages for books are best treated dry to preserve their prepared surface. A very closely matched but thicker paper is chosen and beaten to a similar thickness, surface and translucence. As this paper is too strong to be water torn, and the addition of water would alter the surface, transmitted light is used to trace each infill several millimeters larger than the loss. These are then cut out and the edges thinned and feathered with a scalpel. Infills are placed trimmed side facing in and attached to the front or back of the document where writing will be least obscured by the overlap. Wheat starch paste is applied to the edge of the loss. The infill is set in place and rubbed and/or tapped through a protective layer to improve adhesion. Infills for losses in thicker papers are not infilled with multiple layers of paper and paste as these will stiffen, break at the abutted edges of the loss and cause creasing. A single piece of repair paper the same thickness as the document is cut out, carefully thinned around the edge and pasted in place. Weak, thin and creased areas are reinforced with the same repair paper carefully thinned, feathered and pasted in placed. If humidification of the object is inadvisable when flattening, localized weighting of areas immediately after infilling will eliminate cockeling. Humidification with Goretex followed by friction drying is also a safe and effective method. Over-all flattening is avoided when judged unnecessary. Upon completion of localized treatment, the object is restored to its original format when possible. A folded letter is refolded and replaced in its paper wrapper. Book covers are repaired and reattached to the text block. The cover, multiple sheets and roller of a handscroll are reattached and rolled. All the original elements will be reused if possible. Missing pieces will be replaced so that they are harmonious with the object but recognizable as later additions. Fragile objects are given further support. Handscrolls commonly have a detachable roller clamp added to the roller to increase the diameter of the scroll and lessen stress from handling. Several meters of a compatible paper may be rolled around the roller and pasted in place to produce an identical result, though less obtrusive and costly. Auxiliary covers and mounts for books and scrolls are added for further protection in handling and storage. Finally, storage boxes are provided. Chinese objects are placed in traditional Chinese style book boxes or silk wrapping cloths and paulownia wood boxes. Japanese objects are put in their traditional equivalents. These well fitted boxes are a simple and effective way to compensate for climate fluctuations. This is only a brief overview of the tradition of mounting in Japan and a few techniques employed for treating common conservation problems in early Chinese and Japanese documents. With the increasing influence of scientific analysis and enhanced observation techniques, there is a deeper understanding of the materials and structures of cultural properties. This broader perspective has engendered a growing awareness of the importance of traditional methods and materials that are deemed sympathetic to the object while preserving appearance, original function and integrity for historic as well as aesthetic appreciation. In preparation for an exhibition in Japan in 1988, the curator at the Museum of Ethnography, Sweden, asked me to examine and conserve a group of Loulan documents. He wanted a treatment which would provide ease of storage, display and study, yet also ensure good conservation.The documents in question consisted of 113 items on paper and 117 wood slips. The documents should not be handled directly. It should also not be necessary to handle the documents in display and storage. Mounting will provide the best conservation of the documents. The documents are rectangular and triangular with both straight and irregular edges. The recto and verso of the documents both contain inscriptions and important technical data. The paper of the documents is inherently strong enough not to require lining. Multiple documents are fixed on paper boards by paper tape taken from the margins of postage stamps. No water is to be used. No lining paper is to be applied. Folds and wrinkles are not to be eliminated from the documents. Tears in the documents are to be infilled with fibres of kozo paper. The beginning section and subsequent missing sections of each document are to be infilled with kozo paper. Each document is to be held in the middle of a sheet of Japanese handmade kozo paper. This technique is called 'inlay false margin'. Minimum paste is to be used for the infilling of tears and the inlay false margin, and the paste is to be applied to the ends of the paper fibres, not on the paper body itself. Space will be left around the documents, between the kozo paper margin and the edge of the document itself, and will be filled with kozo fibres extended from the body of the paper. The kozo paper must be softer than that of the documents. The kozo paper selected is tengujo paper which is one of the thinnest Japanese papers. The mounting method is the window mat folder. The documents are to be fixed on a paper board at the false margin with kozo paper hinges. The paper board used is Museum Board made by a German paper company. The gummed linen hinge is to be pasted by an adhesive not by pressure sensitive adhesive. Prepare a full scale photograph of the document. Place kozo paper on the photograph. Trace the shape of the document on the kozo paper in pencil after positioning the document at the centre of the kozo paper. The tracing line is to be 3mm inside the outer edge of the document. Cut the paper exactly along inside of the pencil line. Cutting controls the extent of the fibres from the paper body. Fray the edge and tease out the fibres of kozo paper using a pointed tweezer. This becomes a 'false margin'. Place a transparency film (as used for OH projectors) on the document. Finally adjust the margin paper body so that it surrounds the document with a 1mm gap on the transparency. Place the margin paper on the document. Insert a spatula between the document and the margin paper. Paste is applied onto the fibre edges with a brush. Slide out the spatula and press the pasted fibre tops onto the document with a bone folder. The pasted fibres are lightly brushed out onto the documents edges. The conservation treatment gave us very good chance to examine the papers and enabled us to learn about Loulan paper-making techniques in the third century. The front surface of the papers were nearly same among the 26 items. There were 13/19 laid lines in 3 cm and the verso of the papers show tracing lines from brushing. The bulk density is from 0.30/0.56. For a long time, people have studied and describe the social life of Buddhist monks and nuns using relevant records from the Buddhist Canon. But, in fact, the descriptions in these documents is somewhat idealised. In this book, the author has used contemporary Dunhuang manuscripts and ancient books to make a thorough study of the actual situation of Buddhist monks and nuns, particularly during the period from the late Tang dynasty to the early Song dynasty. The author focusses on the mode of life of monks and nuns, starting from the procedure of leaving secular life to become a monk or a nun, to the process of full initiation into Buddhist life. He shows that this life in Dunhuang was not a collective one. That is to say, most monks and nuns lived outside the monasteries, and resided with their families, relatives or others. Moreover, those who lived in the monasteries also led individual lives. The author also makes a study of the number of Dunhuang monks and nuns and their tax and labour duties; the quantity and type of property held by monasteries; and the relationship between the clergy and this property. As for those Buddhist monks who lived outside the monastery, it was necessary for them to seek living expenses. Their sources of income, and the relationship between their incomes and their religious activities are also covered. The result show that the incomes gained from their religious status and religious activities occupied an important place in all of their earnings. The book also discusses other issues, such as the legacy and funeral arrangements of the clergy, and the effects that religious policy implemented by the local secular authorities had on the lives of the clergy. The conclusions provide a completely new way of understanding the actual lives of Buddhist monks and nuns. Ed. Note: see also Jacques Gernet, Buddhism in Chinese Society: An Economic History from the Fifth to the Tenth Centuries, trans. by Franciscus Verellen (Columbia University Press1995), and Gregory Schopen, Bones, Stones and Buddhist Monks, (University of Hawaii Press 1997) for books in English on the same theme. AsianDOC, the e-newsletter and the mailing list, supports communication among members of the 'Association for Asian Studies' (AAS) interested in electronic resource development and of 'Scholars Engaged in Electronic Resources' (SEER) which was formed at the International Congress of Asian and North African Studies (ICANAS) in 1997, as well as other scholars, researchers, and librarians interested in databases for Asian Studies. Special Issue on Mongolia, edited by Caroline Humphrey and Uradyn E.Bulag, Mongolia and Inner Asia Studies Unit, University of Cambridge. Offering a detailed sudy of the saddles and the loads of Chinese statuettes of camels that were placed in tombs as mortuary furnishings this book provides information on the goods traded along the Silk Routes over a period of approximately one thousand years. Besides discussing the original breeding grounds and domestication of camels, special attention is paid by the author to silk, the main commodity, and its dissemination across Asia. Considerable changes in the depiction of the loads occurring over time, moreover, permit insight into the nature of Chinese religious beliefs and funerary practices between the Han and the Tang dynasties. These two large volumes, comprising over 900 pages, constitute the most comprehensive body of scholarly investigations on the prehistoric and early historic inhabitants of the Tarim Basin and surrounding areas. The excavation of over 200 such burials has revealed information vital to the understanding of early cultural contact between Eastern and Western Eurasia. This is a new field of research - prompted by the recent discovery of abundant and extremely well-preserved human remains in the region - which has important implications for the origins of the Indo-Europeans and the development of civilization in East Asia. Distinguished authorities from a dozen nations have contributed 46 papers on archaeology, migration and nomadism, linguistics, genetics and physical anthropology, metallurgy, textiles, geography and climatology, history, and mythology and ethnology. Maps and Illustrations xv+912 pp. Clothbound hardback. Left:Dr Elizabeth with Zhuang Xiaoming, a photographer from the Chinese Buddhist Association on his SBFT funded visit to the British Library in 1990-91. We will all miss Dr Elizabeth. She had taken a personal interest in IDP for over a decade and everybody who met her was bowled over by her enthusiasm and enjoyment of everything she saw. We first applied to the Sino-British Fellowship Trust (SBFT) of which she was Chair, for funds to assist in our efforts to conserve the 7000 or so Dunhuang 'fragments' by bringing conservators and Dunhuang specialists over from China in 1990. Since then, SBFT has been a very valued source of financial support to us, enabling the Library to continue to invite Chinese scholars to catalogue the material that has been so recently conserved and to work on other aspects of the Stein collections. I only got to know Dr Elizabeth in old age and was fascinated to hear her reminisce, although I am grateful to Anne Ely for her biographical notes on her aunt which reveal more of Dr Elizabeth's extraordinary life. Her father died when she was only 14, after some years of disablement when her mother struggled to support the family. After her first marriage (celebrated in Calcutta Cathedral), Elizabeth returned to England and eventually became political secretary to Eleanor Rathbone MP and began work first with the Basque Relief Trust and then with British United Aid to China (BUAC), set up in response to the Sino-Japanese War. By 1942, Dr Elizabeth was Organising Secretary of BUAC and in 1946, she visited China with Lady Cripps. They met both Mao Zedong and Chiang Kai-shek (who invested Dr Elizabeth with the Order of the Brilliant Star of China, 6th Class). On their return, BUAC was turned into the SBFT to offer financial support to Chinese scholars and students studying in the UK. Dr Elizabeth's life was remarkable - that she managed to achieve so much despite an unpromising start in life (quite apart from the SBFT, she raised some £14,000,000 for limbless ex-servicemen!) was due, I think, to her strength of character and her charm. Though Dr Elizabeth was unique and irreplaceable, fortunately for Chinese scholarship, the SBFT continues with her niece Anne as Chair. Professor Fujieda had been a frequent visitor to the British Library since the late 1960s, although his deteriorating health curtailed his visits in recent years. A systematic study of the Stein collection over this period provided the foundation for his ground-breaking work on the codicology of Dunhuang manuscripts. This research is of immense importance for the identification, dating and understanding of genuine Dunhuang manuscripts and also, of course, for Dunhuang forgeries. Therefore, when I decided to organise a workshop on forgeries in 1997, it was with the hope that Professor Fujieda would be able to attend as guest of honour. Although his health was poor, he decided to make the long journey to London and proved an enthusiatic and provocative presence. It was a great pleasure to meet and talk to him. The workshop culminated in a public lecture given at the School of Oriental and African Studies at which Professor Fujieda was received with great warmth. The proceedings of the conference (to be published in 1999) will be dedicted to his memory. Professor Fujieda also published widely on Central Asian history, calligraphy, on Chinese seals, and on the cities of Kyoto and Osaka. He received many awards, included the Legion d'Honneur. His skills included photography: he developed innovative techniques for the photography of Dunhuang manuscripts to highlight their important features as described in his codicology. Like all true scholars, Professor Fujieda was not afraid to challenge long-held beliefs: his views on forgeries remained unpopular for many years. The true value of his work will be proved over the years to come as scholars use his codicology to examine the increasingly accessible body of Dunhuang and Turfan manuscripts, and to evaluate the extent of the forgeries. We have reason to be grateful for his persistence and resilience in bringing this problem to light. 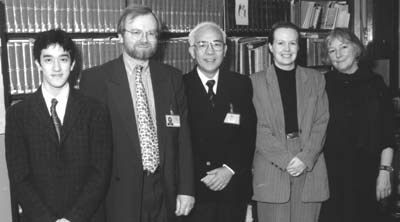 Right:Professor James Chiang (centre) with (from l. to r.) Frances Wood, Susan Whitfield, Graham Shaw and Colin Chinnery of the British Library. The Project was pleased to welcome Dr James Chiang, Vice-President of the Chiang Ching-Kuo Foundation for International Scholarly Exchange, in March this year. The Foundation has been the major supporter of IDP since its inception in 1994. We recently learned that our application for a fifth year of funding has been successful and are very grateful for the Foundation's continued generosity. 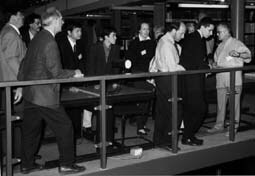 Their funding over 1997-1998 has enabled the Project to launch its interactive database web site (see front page). We have also received a generous individual donation to enable the continuation of a data-inputter on the project. All such donations are very gratefully received and can be spent entirely on Project work as administration and overheads are covered by other funds. At the 3rd Conference the representatives from the Institute for Oriental Studies, Russian Academy of Science, St. Petersburg, expressed their wish to be hosts for the Fourth Conference and suggested the date of September 1999. Their most generous offer was accepted by the participants. Details will be carried in future newsletters. Colin Chinnery of IDP spent three weeks at the Huntington Archive of Buddhist Art in Columbus Ohio in August to exchange knowledge and techniques for scanning and manipulation of images in Abode Photoshop. Thanks are owing to Janice Glowski and John and Susan Huntington for hosting the visit. The Or of the British Museum and will be published shortly. It contains a list of the various institutions holding Stein material - from his finds to correspondence and photographs - with the type and extent of the material, its history, and details of access. Full ordering details will be given in the next issue of IDP News.